This album is dark, contemplative, and utterly brilliant. 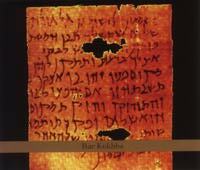 A 2-CD set of Masada chamber ensembles, (all composed by Zorn) the music explores Jewish scales and modes in many contexts. There are echoes of jazz, classical, surf, avant-garde and klezmer in this captivating piece of work. The incredible variety of musical styles doesn't hurt the album, but rather enriches it. The album is arranged so that the different players play with each other in small groups (the largest beings quartets on Nezikin and the second Sheloshim). Thus there is a lot of room for the musicians to improvise. In fact, two of the most moving tracks on the album are Anthony Coleman's solo take on Yechida, and Marc Ribot's 13:11 minute solo piece "Mochin." There are tracks for jazz trio, string trio, guitar/bass, and clarinet/organ.